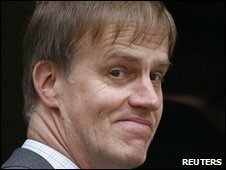 Former Labour minister Stephen Timms has been stabbed twice in the stomach at a constituency event in east London. Mr Timms, 54, is being treated in Royal London Hospital. His injuries are not said to be life-threatening. A 21-year old woman was arrested after the attack at about 1500 BST at the Beckton Globe Library in Newham, where the MP holds a regular surgery. Mr Timms served at the Treasury under Tony Blair and Gordon Brown and was recently re-elected as MP for East Ham. A Metropolitan Police spokesman said a knife had been recovered from the scene. 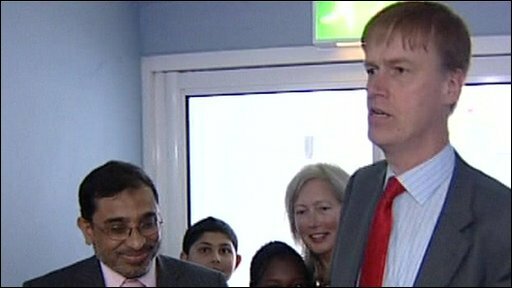 Unmesh Desai, the MP's aide during the general election, said Mr Timms was "obviously shaken". The MP will undergo exploratory surgery to see the extent of his injuries and will remain in hospital overnight. Mr Timms is reported to be sitting up in Royal London Hospital and talking to staff. A hospital spokesman described his condition as "stable". A 16-year-old girl, who did not want to be named, was present at the incident and described the scene. "I saw everyone screaming. There was a bit of blood on the floor," she said. "It was quite dramatic. I saw him being dragged into another room. There was blood on his shirt." Mayor of Newham Sir Robin Wales said: "My understanding is there was an appointment made for the woman. "At the beginning of the interview she stabbed him." The woman was disarmed by one of Mr Timms' assistants, Andrew Bazeley, before the security guard arrived, Sir Robin added. The MP has told friends he had not met her before and has no idea why she attacked him. Acting Labour leader Harriet Harman passed on her best wishes and said: "Parliament needs to consider how best to ensure MPs can carry out their responsibilities safely. "One of the great strengths of the British political system is the everyday accessibility of MPs to their constituents, but we can't have a situation where MPs are at risk." Liberal Democrat peer Nigel Jones was himself wounded and his aide Andrew Pennington was killed in a sword attack in 2000 during a weekly constituency surgery in Cheltenham, Gloucestershire. Mr Jones said: "My heart goes out to Stephen. "I'm very keen for MPs to meet their constituents face-to-face... but there are measures that can be taken." He said that following the 2000 attack police recommended security measures for him including installing a panic button, which were followed. The peer suggested that all MPs, especially new MPs, should contact police and see that their security arrangements are "fit for purpose". Mr Jones, then an MP, received lacerations to his hands and arms in the attack. Robert Ashman was jailed for manslaughter and attempted murder. Several MPs sent Mr Timms their best wishes via Twitter. Labour MP for Glasgow South Tom Harris wrote: "Awful news, Stephen. Wishing you a very speedy recovery." Greg Mulholland, Liberal Democrat MP for Leeds North West, wrote: "Awful news about Stephen Timms, thank goodness not life-threatening. "Stephen is one of politics' thoroughly nice guys, a real gentleman." Mr Timms has regularly spoken out against knife crime in his constituency, particularly among young people. Mr Timms later issued a statement expressing his "thanks and gratitude to both the staff at Beckton Globe for their assistance, and the ambulance and hospital staff for their fantastic care". The MP was a close confidant of both Gordon Brown and Alistair Darling during Labour's 13 years in government, serving latterly as financial secretary to the Treasury. He has been MP for the constituency - and previously for Newham North East - since 1994. His personal popularity in his constituency is reflected by the fact that he secured a 7.7% swing from the Conservatives in last week's election, when Labour was generally losing ground across the country. Mr Timms won 70.4% of the vote and his 27,826 majority is the largest in the new House of Commons. Married to Hui-Leng Lim, he describes himself as a Christian Socialist and is Labour's vice-chairman for faith groups. Cabinet ministers and former ministers, particularly those who served in departments such as the Home Office and the Northern Ireland Office, have security protection. The majority of MPs do not.